The Bank of Japan’s unexpected rate cuts to negative are a desperate attempt to help out the FED and to support the dollar at the expense of the aging Japanese population. The negative market reaction to the FED’s rate hike of December shows that investors do not believe an economic recovery in the US is underway. Two reasons make central banks start to raise interest rates. The first is that economy is doing well, and central banks have to prevent an overheated economy. But it is also a signal to investors that everything is going well and so they will react in a way other than the one intended for them by central bankers in that they will increase their investments and thus cause the markets to go up. The second reason central banks raise interest rates is the defensive one; the moment the economy is out of control, investors are beginning to abandon the sinking ship. The continually increasing interest rate has the task of keeping the investors aboard. Central banks in less developed economies raise rates to defend the national currency, thus preventing investors from fleeing. An increase in the interest rate can add fuel to the fire and in many cases has the opposite effect. Investors start smelling the angst of the authorities and start abandoning the sinking ship. In such a situation stock markets are coming crashing down because investors withdraw from them. We saw this latter pattern happening in the US economy after the December FED’s rate hike. As a result, the dollar-yen exchange rate is starting to decline, with the value of the dollar falling off as Japanese investors start panicking and fleeing the US market. Surely, Japanese investors know that a rate hike without an accompanying economic growth will erode every existing investment. The endless trade deficit the US has with Japan shows how much the Japanese are prepared to provide the US with real goods without demanding tangible goods in return. Because the international press publishes trade data in dollars, the trade balance deficit seems to have been shrinking over the last years. The actual situation becomes apparent if we look at the trade deficit in yens. 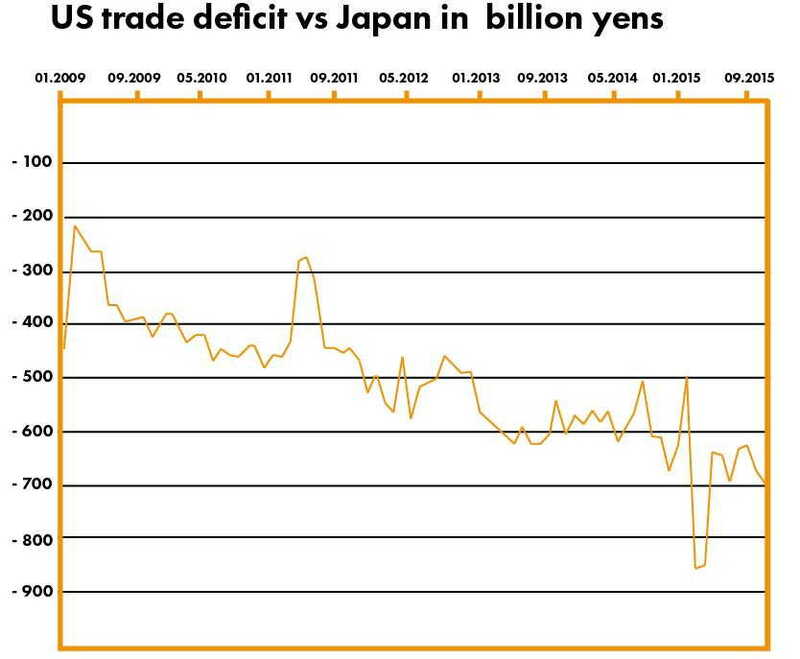 The US trade deficit with Japan is growing bigger and bigger year after year, as Japanese producers are giving away a big chunk of their production to US consumers in return for more and more US paper debt. By manipulating the yen, Japanese authorities are giving away a real part of their GDP that they take from their people and hand it over to the US empire. In January, the yen started to appreciate because Japanese investors withdrew their money from the shaky US economy. Not only does an expensive yen lower the purchasing power of US consumers, but it can also render the US’s Asian military pivot1 quite expensive. It looks like Kuroda-san, president of the Bank of Japan, got new marching orders from his US masters during his Davos visit. The submissive Japanese leaders have no choice but to obey their US masters and come up with a next trick to keep the yen cheap. The Bank of Japan does not have much room to maneuver, so it lowered the excess-deposit rate into negative territory. It was marginal from 0.1 to -0.1 and only applicable to a small number of the Japanese bank deposits at the Bank of Japan; nevertheless, the music started playing again. It will be harder for Kuroda-san to press the yen lower and come up with new tricks indefinitely. Investors may be fooled by the vast amount of public debt of the Japanese government, not realizing that the Japanese nation as a whole has a massive saving surplus. Some day the Bank of Japan will run out of tricks, and the yen will explode as Japanese savers will try to repatriate their savings. It will affect not only the financial markets but also the US ability to counter its Chinese rival in the Yellow Sea. For now, the desperate move of the Central Bank of Japan will not help the aging Japanese population. It will keep the financial markets happy for a short period. This is all pure nonsense. What Japan does with their dollar or foreign dollars does little to effect the grocery store owner down the street, or the plumber or carpenter building or repairing a house, or the janitor in the school.